This article is for the My Stream -page which is the social landing page combining all the posts that are relevant for you. It is made up of two streams the first my stream and the second is the my news. Even if your administrator has set the landing page to My Stream you can always access the companies Home page through the pages menu. The left hand feed has all the new posts from channels you are a member of and can be customised by joining or leaving channels. You can also mute channels if you do not want to see them in you my stream. Channels can be managed from your User Settings. 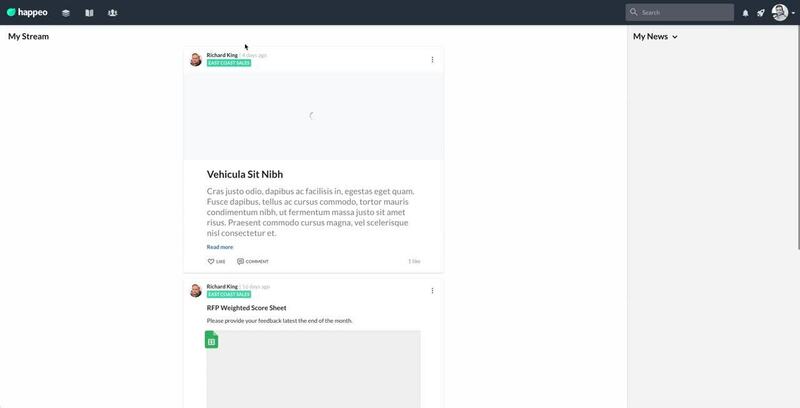 The right side feed has all the company news and may hold more than one news feed and you can filter between the news channels by moving your mouse over the "My News" and selecting the news feed you want to read. The news feeds are defined by the company administrator.